Forecasting recessions is hard. Just ask the IMF. 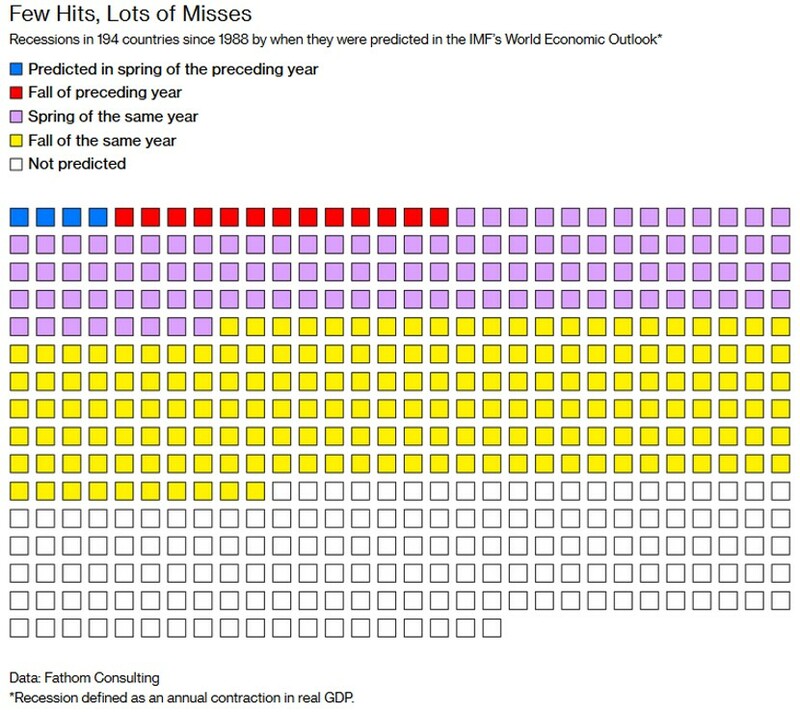 The chart below, based on the work of Andrew Bridgen, chief economist at London-based Fathom Consulting, shows that the IMF has only managed to forecast 4 out of 469 recessions (defined here as an annual contraction in real GDP) since 1988 in its spring (April) outlook for the year preceding the recession. The IMF correctly anticipated recessions in Equatorial New Guinea (in 2010 and 2015), Papua New Guinea (1997) and Nauru (2018). I’m no expert on the matter but it seems to me that forecasting recessions for these, somewhat more exotic countries, can be pretty different from forecasting recessions in more developed markets, for which the IMF did not get one prediction right in its ‘pre-recession’ year spring outlook. 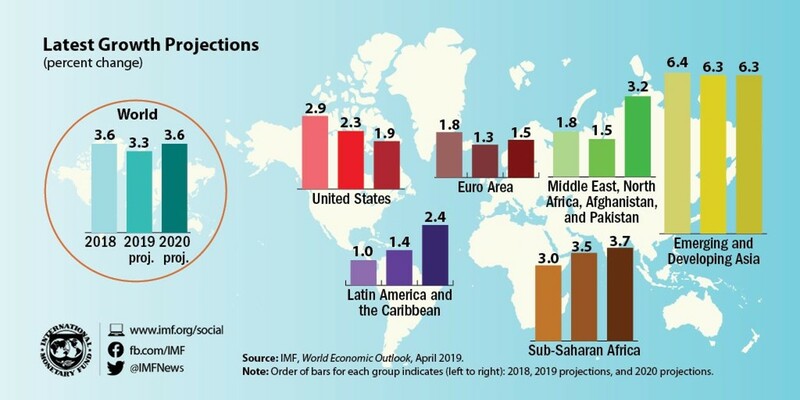 One year later, in its spring (April) outlook in the year of the recession (again, defined as an annual contraction in real GDP), the IMF predicted only an additional 111 recessions. By now the total number of recession predictions is still below a quarter of the actual number (469). Or put differently, with just 8 months until the end of a ‘recession-year’, the IMF predicted just one out of every four recessions. The number of recession forecasts rose by another 182 in the IMF’s fall outlook, published in October. In the four IMF outlooks from spring the year before the recession, until fall of a recession-year, the IMF forecast a cumulative of 310 recessions, still missing one third of all recessions since 1988. In defense of the IMF, other research shows the IMF economists are no exception. Consensus estimates too miss a large number of recessions. But why is this the case? First, there could be a lack of (financial) incentives. Unlike investors, economists have no money involved when forecasting future GDP growth. While there is certainly a difference between investors and IMF economists, they too have an incentive for doing their job right. Better predictions mean better reputation and esteem for both the economist and the IMF, which in turn could also lead to higher financial compensation. Second, there is the risk of group think. Who wants to be that bear economist forecasting doom and gloom? Also, assuming that central banks and governments are able to prevent recessions using appropriate policies, as economists tend to do, leads to more ‘base case’ scenarios without recession. Third, a kind of loss-aversion may be at play here as well. Holding on too long to initial forecasts because of reluctance to adjust growth numbers based on new incoming data, hence reluctance to take a (forecasting) loss, would resemble behavior seen regularly among investors. Last, but certainly not least, it is probably also because forecasting recessions is just incredibly difficult.